The first-ever BMW 6 Series Gran Turismo has been launched in India at the ongoing Auto Expo 2018. 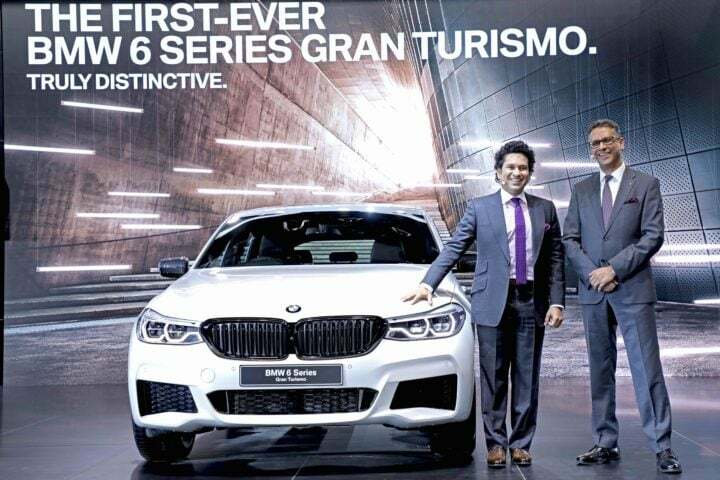 Mr. Sachin Tendulkar, the legendary cricketer and the brand ambassador for BMW India, unveiled the new car at the motor show. The new 6 Series Gran Turismo is available in a locally-produced petrol variant, the BMW 630i Gran Turismo Sport Line, and can be booked at all authorized BMW dealerships across India. The diesel variant will be launched later this year. The ex-showroom price of the BMW 630i Gran Turismo Sport Line is INR 58,90,000. The new BMW 6 Series Gran Turismo is available in Sport Line trim only. It is powered by TwinPower Turbocharged 2.0-litre petrol engine that outputs a maximum power of 258 hp along with a peak torque of 400 Nm. The new car can sprint from 0 to 100 kmph in just 6.3 seconds. The engine comes mated to an 8-speed Steptronic Sport Automatic Transmission. There are four driving modes to suit diverse driving conditions – Sport, Comfort, Comfort+ Eco Pro and Adaptive. The adaptive 2-axle air suspension with automatic self-levelling not only provides supreme ride comfort but also sharpens the car’s dynamics. Safety features include- six air bags, Anti-Lock Braking System (ABS) with brake assist, Dynamic Stability Control (DSC) including Dynamic Traction Control (DTC), Cornering Brake Control (CBC), Hill Descent Control (HDC), Side-impact Protection, Runflat tyres (RFT) with reinforced sidewalls, electronic vehicle immobiliser, crash sensor and emergency spare wheel. So, tell us, what are your thoughts on the BMW 6 Series Gran Turismo? Let us know by commenting below. Also, stay tuned to Carblogindia for the latest news on cars and bikes relevant to the Indian market.